Question: What do you think of line-class records? Don’t they just encourage people to go out and try to catch fish using gear that’s lighter than it should be? I think there should be just three records for every species: all-tackle, fly-fishing, and kids’. Doing it this way would mean fewer dead and/or harassed fish, wouldn’t it? Answer: Oooh. This is one of those third-rail issues. I must admit that I’m not really a fan of line-class records. Years ago, I guided an angler on the Copper River in Alaska, and he was determined to catch a sockeye on 2-pound-test so he could be in the Freshwater Fishing Hall of Fame Record Book, which had a bunch of “open” line-class records—meaning that any fish submitted would automatically be the record. I would say he mouth-hooked about 25 salmon, dragged ’em around for various lengths of time, and landed zero. I remember thinking that it was a pretty unethical way to go about it. I also think it’s a little silly when the record fish for a particular line class weighs less than the breaking strength of the line. So, for instance, you might see that the record for 20-pound-test is a 10-pound fish. Brant Oswald, Livingston, MT-based guide and fly-fishing instructor: As a trout guide, the record book is not of much concern to me or my clients. (I’ve always thought a fly-rod record for mountain whitefish would be fun, but they grow them bigger in Colorado rivers than they do in Montana.) As a more specific response to the comment about “using gear that’s lighter than it should be,” I do see people using very light tackle for the novelty of it, rather than because the fishing situation demands it. If one plans to release the fish, anglers should use tippet that is strong enough and a rod with enough power to land a fish in a reasonable amount of time. Having said that, as a spring-creek guide, I use and recommend 2-4 weight rods and 6-7X tippets for most of the season. Using light-line rods and light tippet should not be an excuse to play fish for overly long periods—even if everybody on a crowded stream is watching, and even if you really want a picture to show your buddies when you get home. 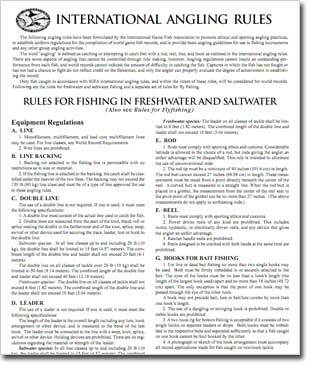 In my experience, the real issue with the use of light tackle is that most freshwater anglers are not that skilled at playing fish. In typical trout fishing situations, relatively small fish and strong modern tippet materials mean that an angler can do a lot of things wrong after the hookup and still get the fish in the net. Lighter tippet and/or bigger fish place a higher premium on fish fighting skills—and teaching clients how to apply maximum pressure with light tackle is a big part of my spring-creek guide program. The lighter line classes for each species in the record book represent the extreme end of this light tippet/big fish scale. One would hope—out of respect for the fish—that an angler would hone his or her fish fighting skills before embarking on an attempt at setting a record. Brian O’Keefe, photographer and editor of Catch Magazine: I have always thought that world records should honor the fish and not the fisherman, especially trollers and the novelty anglers like your guy on the Copper. (I guided the Copper, too, in 1980.) Yeah, line class records are a thing of the past. Matt Supinski, Great Lakes guide and owner of Gray Drake Lodge: This is all macho garbage. Fly Fishing is an intelligent pursuit of selectivity, deception and presentation. It is a brilliant fusion of science, art, and sporting mastery…..period! When my client and I caught a world-record IGFA Atlantic salmon (26.7 lbs) last fall on 3X, 8-pound flourocarbon, we used such light tippet because of the extreme clarity of water, and the relatively small fly-tippet size was an adjustment necessary to fool an extremely wise Salmo salar in Caribbean-like clear ultra-spooky conditions. On a dark, tannic stained river in Norway, we could have gotten away with 15 pound dark Maxima. You fish 8X with size 28 midges not for the challenge, but for the empirical necessity of presentation. If you manage to catch a world-class fish and land it on such light tippet, good for you. Most often it is dumb luck that allows for such an event. Jim Bartschi, president Scott Fly Rod Co.: Fly fishing for world records in general, and line class records in particular, is its own endeavor, and doesn’t closely resemble what most of us consider “normal” fly fishing. The techniques required to land a fish on disproportionately light tippet are quite different, and in my experience, have limited appeal to most anglers. (The kinds of techniques I’m referring to are things like following a hooked fish around in a boat for long periods of time when the same fish could be landed much more quickly on appropriately sized tackle). Just because this type of fishing isn’t personally appealing to me or many other anglers doesn’t mean it should be banned. I think there is room for any legal technique or equipment in our sport whether we personally like to use those or not. Legal methods of fishing and bag and possession limits are set by state and federal fisheries management agencies, and from my point of view, that’s a good thing. For example, some people like to swing traditional flies to steelhead and would never “bobber fish” for them with a nymph-and-indicator rig. Others love nymphing for steelhead, and still others use whatever style they feel fits the situation presented. Should one of these three anglers determine which way the rest of us fly fish for steelhead? Frank Smethurst, fly fishing guide and TV personality: I have a lot of respect for some of the achievements that some of these records signify, so I don’t at all dismiss them. The quest for records, as with perhaps racing for cars and bikes, has given us quantum leaps in our rods, reels, and particularly lines and knots. The Bimini twist, for example, is a knot that came into being purely from the quest to land really big fish on light tackle. I also like the knowledge of the outer envelope of fish size and angling technique. It gives perspective on our everyday catches. Though I am not a record hunter, I will tell you that photographing and releasing a 25-pound largemouth or a 225-pound Tarpon would be a huge thrill, even if the fish did not hang up at dockside or become an “official” record. It is common knowledge in the guiding community that several 200-plus-pound tarpon have been landed, though not killed, and this is homage both to the record itself, and also to another possible ending of the encounter.